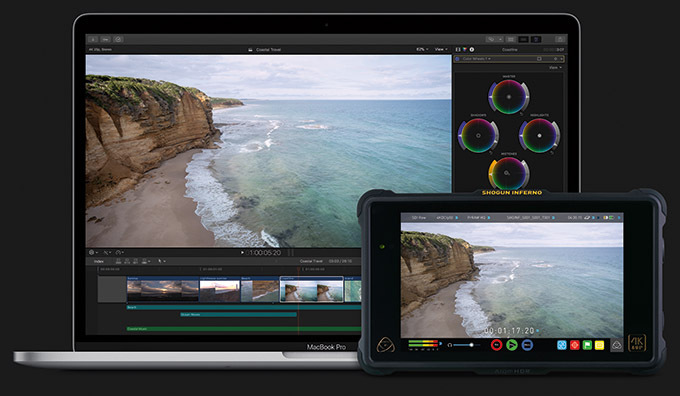 This year, at the 2019 NAB Show, several companies announced support for ProRes RAW, the latest codec from Apple in the ProRes family. Here is a list of the companies making announcements earlier today and the products that are affected. Filmlight: The latest version of the core Baselight software, version 5.2, and Daylight now support native access to the ProRes RAW format. This is one of the first full implementations of the ProRes RAW format from a world-leading professional colour grading application. The high-quality ProRes RAW image format is now available on cameras from a wide range of vendors, including Canon, Panasonic and Nikon via Atomos recorders, and directly on the DJI Inspire 2 with a Zenmuse X7 camera. Assimilate: Assimilate announced its SCRATCH software product line is among the first to support Apple’s new ProRes RAW acquisition and compression format. Dailies and post-production artists will now be able to read and import ProRes RAW files into SCRATCH for streamlined workflows, from dailies through post-production. Colorfront: Colorfront Transkoder is recognized as the ultimate post workflow tool for handling the vast range of UHD, HDR camera, color, editorial/deliverables formats. MTI Film: the CORTEX software family of products provide high quality, powerful and secure workflow solutions which offer comprehensive solutions for dailies processing, media management, deliverables and more for on-set and post-production. Grass Valley: “Edit Anything, Fast”, EDIUS is an outstanding real-time editor for professional filmmaking. Grass Valley announced support for ProRes RAW in EDIUS 9.4 with a planned release date later this spring.